This guide will help any interested New Yorker understand and participate in the city's budget process. It outlines the components of the city's budget, the timelines and processes for adopting it, and provides an overview of how the city raises revenues and how those revenues get spent. Guidance on where to find budget documents and a contact list of key players in the budget process will help readers figure out where to find answers to budget questions. 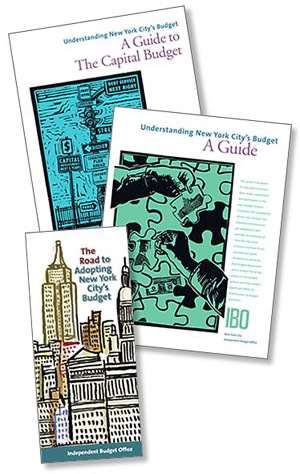 This guide is designed to help New Yorkers understand and participate in the city's capital budget process. It outlines the components of the city's capital budget, the timelines and processes for adopting it, and provides an overview of how the city raises capital funds and how those funds get spent. This brochure is your roadmap to how the city sets its spending priorities for the services that affect your daily life. New York City's budget – more than $62 billion in fiscal year 2008 – funds public services such as education, sanitation, police, fire, parks, jails, libraries, and cultural institutions. Phone numbers for some of the key players in the budget process are included. We encourage you to get involved by staying informed and making your voice heard. If you have difficulty downloading any PDF document, please call us at (212) 442-0632 and we will mail or fax that document. Please contact us if you are looking for additional information at the number above. Your call will be routed to the appropriate staff member.